If you already crashed into our blog, you may have noticed that, here in LeadsBridge, we always love testing ideas and strategies in order to find the best solution for our marketing and (most importantly) for your business. This time, we had fun performing a particular funny test! Let’s have a look. But before the start… Do you know why we are always crazy about testing our ideas? Why do we invest so much time and money in testing? The problem is that, when you run a business without testing your advertising campaigns, I can tell you that you are not acting in a way to take best out of it. Understand the customer needs. You never know how your target audience will react to your headline or campaign. By testing, you can find out what would be the best formula for your campaign. Budget. Although testing, on one hand, involves a bigger economic effort at the beginning, on the other side, finding the perfect formula enables you to invest in the most profitable direction and therefore make your investments more efficient. Testing is the basis for any marketing efforts. Investing time in testing your marketing campaigns, will ensure that you connect with your target audience in the best possible way. This time we tested how emojis perform on Facebook Ads and how they can affect the CTR. If you are wondering what an emoji is or why it is so important, just keep reading… If you’re already a master of this topic just skip this paragraph and jump to our test. Emoji was initially born as a visual element to express a feeling through an image. The first emoji was used in 1982 from Scott E. Fahlman to underline the irony in his sentence, due to the fact that sometimes it was difficult to understand the humor through words. The real launch of these funny small icons into our digital communications is dated back to 2011 when Apple decided to add emoji support on the iPhone for the first time. Since then, emojis have been totally blowing up, infiltrating our lives and cultures all over the world and they have undoubtedly become an essential part of our text language. Today, we can firmly say that emoji is a fundamental element of our conversation in order to express our feelings, objects or faces in our social network world (ambient). Along with the skyrocketing of this new language, the brands started to pay attention to these trends and using them in their marketing in order to deliver catchy messages. Why are emojis so powerful as a communication form? Emojis are part of a universal language. Consequently, there are no foreigners, cause independently from the language that you know, you can surely “speak emoji” as well. Emojis are immediate and easy to understand. That makes messages explanatory and much more compelling than the ones that people spend their time trying to understand. The less time it takes to understand the message, the more effective your marketing message will be. 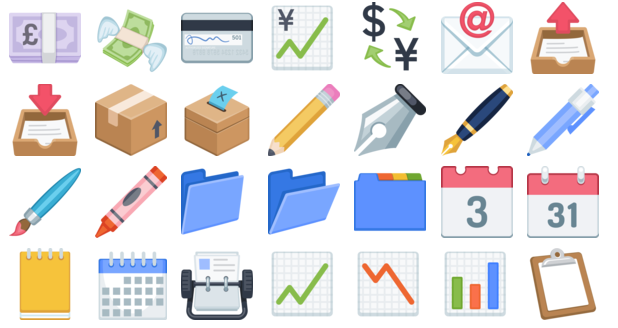 Do emoji really improve Ad’s engagement and CPA on Facebook? The survey shows that 4 of 10 millennials communicate only through emojis. The emoji used inside communication advertisement generates a higher attention along with a higher engagement, around 33% more than the same Ad without it. Amazed by these data, we have decided to test ourselves the effectiveness of the emojis. 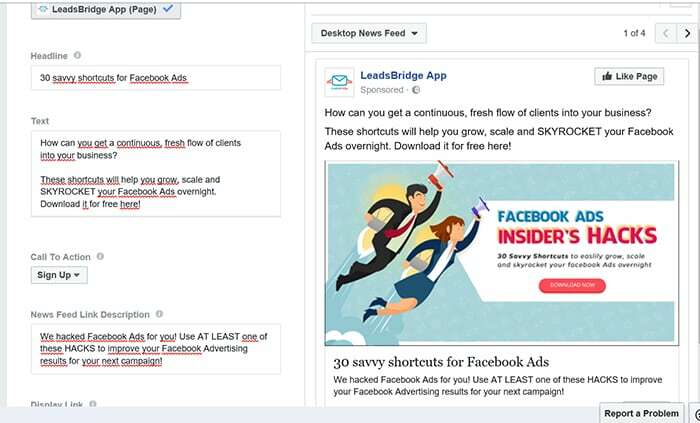 We decided to run a simple test in one of our Facebook Lead Ads. 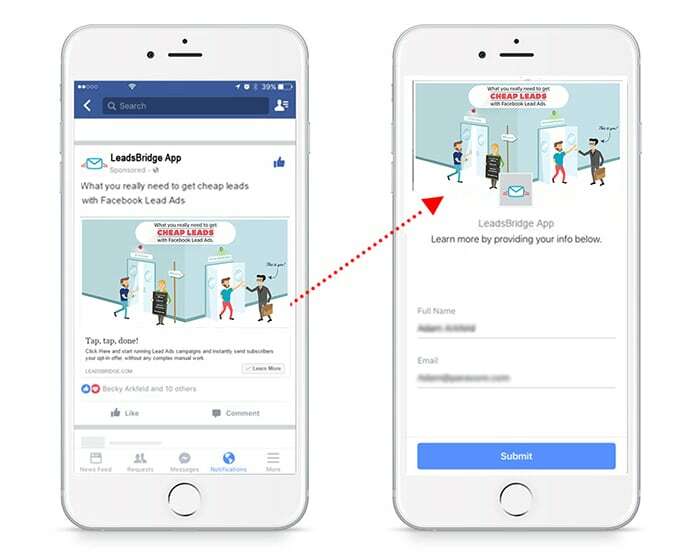 For those who don’t know, Facebook Lead Ads is a tool specifically designed to generate “cheap” leads, allowing you to collect emails and other personal information easily from both mobile and desktop users. If you are not feeling confortable with this tool, don’t worry. You can quickly check out our step by step guide to successfully set your first Lead Ads campaign. As you can see from the image above, there is no usage of emoji in our post description. So, we have decided to use emoji in our short but effective description. The results achieved were unbelievable: the second ad obtained 2000% more leads than the first one. As told previously, emojis are extremely engaging in comparison to the normal words and very efficient in bringing some color and personality into the otherwise monochrome text. Furthermore, they play an important role in an eye’s catch effect when positioned into the post description, where the attention of the reader is more likely to be caught on the emoji post. That’s why people are more stimulated to click. First of all, create a new Ad on Facebook or use an old one which contains only text. 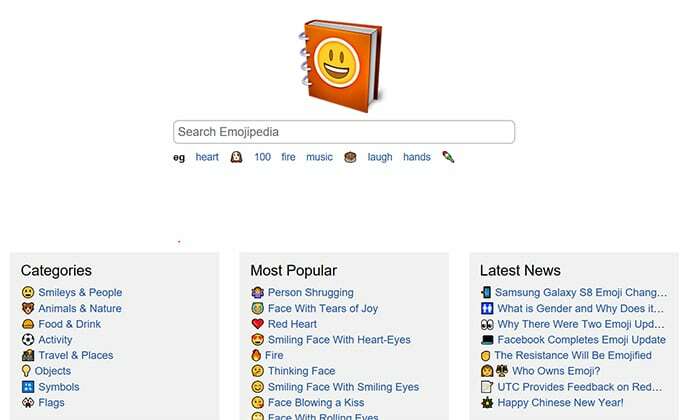 Then, connect to this website where you can find a full list of emojis for Facebook. Below, a quick tutorial on how to find the right emojis for your ad. 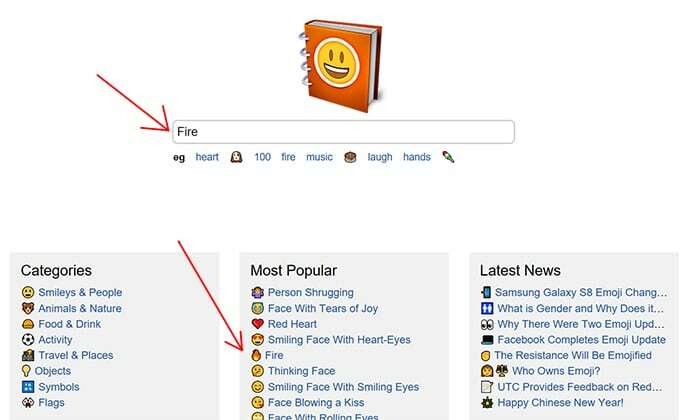 When you are in, you can jump directly to the “Most Popular” category, or use the search bar to find a specific emoji (for example, “fire”). 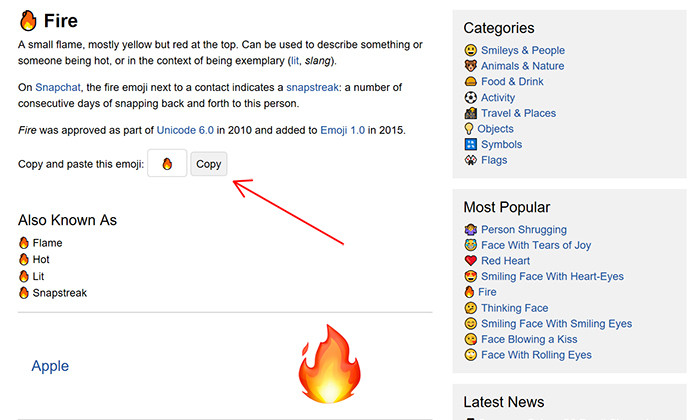 You will display a page where you can Copy and paste the emoji you selected by clicking on the “copy” button. Now, simply paste it into the text of your ads, headline or CTA. In addition, here you can find all the new Facebook emojis, or download the full list in PDF. 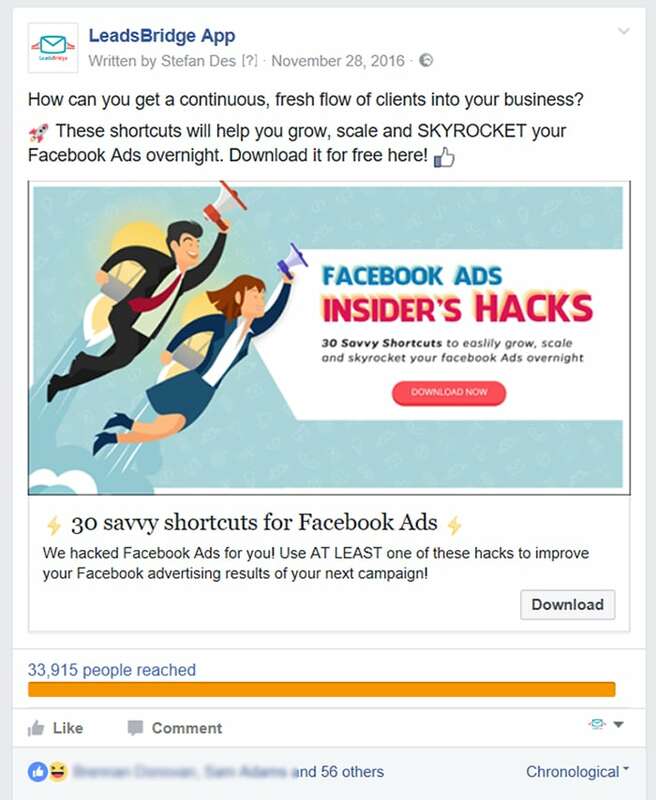 Hope that this article will help you to improve the CTR on your posts, obtaining a better performance of your Facebook campaign. Test, test as much as you can! 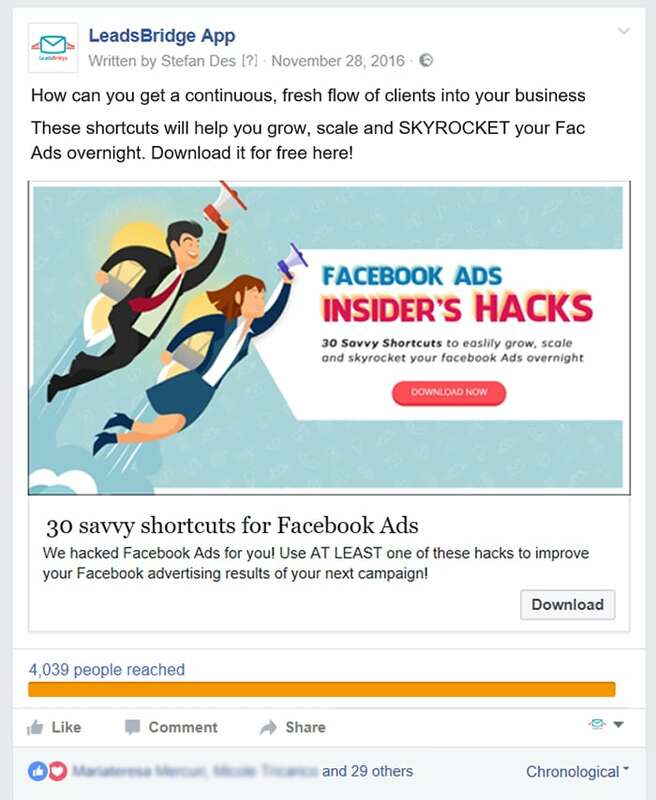 Facebook ads represent a strong opportunity to generate leads and clients for your business, and only by testing you can discover the “perfect ROI formula” for your marketing campaigns that suits your business needs. Do you still have some doubts? Don’t hesitate to leave your thought or concerns in the comments below. We are here to help!